Every year, mid-February signals the beginning of spring training for baseball season. In Arizona or Florida, players of all ranks meet to play lazy, unimportant games and warm up for the long season ahead. And with this start, every year without fail, baseball fans forget what spring training is actually about. From Reddit and Twitter to the Facebook comments section of Sportsnet’s posts, every type of fan can be found complaining about plays so inconsequential that they swiftly escape our memory as soon as the first pitch of the new baseball season is thrown. Whether it is criticisms over a pitcher’s speed and velocity or a hitter’s lack of hustle after a ground ball, spring training elicits unusually pessimistic and overly-serious responses from fans, prompting the question: does spring training actually matter? The short answer is no. The long answer is absolutely not. Spring training is nothing more than a glorified warm-up for old players and an introductory showcase for minor leaguers. Take the 2010 Cleveland Indians, for example. Although Cleveland won almost 70 per cent of their spring training games that year, they went on to finish the regular season barely winning 40 per cent. Currently in the Florida Grapefruit League, the Toronto Blue Jays are barely toeing a 50 per cent record: they’ve won nine games and lost eleven. But that’s not important. The few takeaways from the Blue Jays’ spring training are important though, and all of them revolve around the minor league talent. As has been the case ever since Toronto drafted him, Vladimir Guerrero Jr. has generated the most buzz this spring — but unfortunately, not for the right reasons. Suffering a Grade 1 strain to his left oblique a couple weeks into training, Guerrero was taken out of the game for at least three weeks. Let’s break down what this means. First, Guerrero will not be starting the season in the majors, as he has been reassigned to play for the minor league after recuperating. The Blue Jays’ front office is probably relieved about this. Because of the strict constraints and policies regarding service time — which dictate when a player reaches free agency — teams try to work around the rules so that their top prospects can remain under team control for as long as possible. This usually means keeping star prospects on minor league rosters longer than necessary, and bringing them up mid-season so that they gain an extra year of service time. This extra year of player control can make a difference of millions of dollars, and can also prolong the exit of a star player in his prime. Such a move was almost inevitable for Guerrero: everyone anticipated the announcement that he would be beginning his season with Toronto’s minor league affiliate, the Buffalo Bisons, instead of with the Jays at Rogers Centre. But Guerrero’s injury has freed the Jays’ front office from the ire of their already-disgruntled fanbase. Spring training can give managers a good indication of how they will organize their order — who will bat lead-off? Who will bat clean-up? — and how they will position their outfield. But unless any significant injuries occur, spring training does little to predict the outcome of the regular season. The baseball season is long and expansive: players reach peaks and lows and experience plateaus several times during the six months of play. To view spring training as anything other than a quick exhibition of up-and-coming minor league talent or a chance for seasoned players to warm up before the start of the gruelling season is naïve. Marcus Stroman is the opening-day pitcher for the Jays. His first pitch on March 28 will start the baseball season for Toronto, and we’ll all just have to take it from there. With the 2015–2016 regular season for the Raptors and Leafs coming to a close, we can look back at how important 2015 and 2016 have been for Toronto in the NHL, NBA, and MLB. While the Leafs will never relinquish the mantle as the city’s biggest market, the season was an indicator of the potential for the Raptors and Blue Jays to become bigger attractions as well. For years, the city has seen the likes of Vince Carter, Chris Bosh, Carlos Delgado, and Roy Halladay leave for bigger markets to chase titles. The year 2015–2016 initiated a shift in this mindset. The Raptors and Blue Jays have demonstrated strong regular seasons, playoff runs, and the ability to attract big name players. This begs the question — does Toronto have the potential to become a serious contender in the NBA, NHL, and MLB? And if so, can the city become a desired destination for sought after free agents? 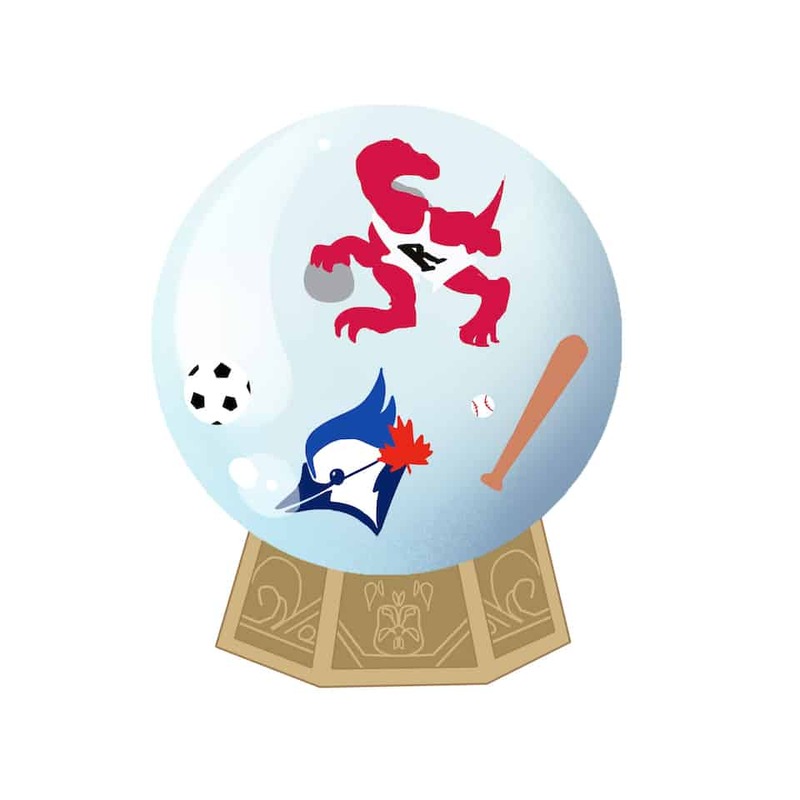 Both the Raptors and the Blue Jays were recently rebranded to consolidate the teams’ respective successes by bolstering regional pride. The Raptors utilized the “We The North” campaign to gain fans while remaining relevant by assembling a competitive team able to surpass the Carter and Bosh eras. Two straight division championships and an inevitable third have put Toronto in the same conversation as Eastern Conference elite teams like the Cleveland Cavaliers. Led by Kyle Lowry and DeMar Derozan, the Raptors showed their willingness to spend with free agent DeMarre Carroll joining the team in the 2015 offseason. Ticket purchases have been a key indicator of this expansion. The Raptors sold out season and postseason tickets in 2013–2014 and 2014–2015 and are expected to do the same during this year’s post-season. All Star Weekend was also a media boost to Toronto. Although the city embraces its ‘outside looking in’ approach to the NBA, the team has made an effort — especially this season — to be at the center of it all. The Blue Jays also experienced a rebranding in 2012, but the team took a retrospective approach, returning to their 1992–1993 championships colours following an era of lackluster years as a fringe team. Their rebrand was met with blockbuster trades for stars like R.A. Dickey and Jose Reyes. Success after the rebrand was not immediate like the Raptors’, but last year’s trades for stars Troy Tulowitzki, David Price, and reigning MVP Josh Donaldson made significant contributions to the Jays’ first postseason appearance since 1993. The Blue Jays are title contenders and the city has taken notice through ticket and merchandise sales. The Jays’ 2015 season illustrated the dedicated fan base baseball can have in a non-American city. The market value for the Leafs will likely never be a problem. Despite their struggles in recent seasons and a rebuild underway, the future is bright for the franchise. The Leafs live in a hard salary cap era, but this has not stopped them from stockpiling talent. They accumulated draft picks, including potential star William Nylander, all under the watchful eye of arguably the best management in the league. GM Lou Lamoriello has won three Stanley Cups and coach Mike Babcock has won the Stanley Cup and two Olympic gold medals. The team has a robust analytics department led by rising management star Kyle Dubas, which has modernized how we view hockey and player evaluations. The road to contention will be long and arduous for the Leafs, but they have the pieces in place to compete again, and the regional market to sustain them. The regional market has the ability to sustain the three major teams, similar to other big markets like New York and Los Angeles. While the more profitable and more popular team is rebuilding itself, their future is bright. The Raptors and Blue Jays are the contenders, and now they have the rosters and fan bases to show for it.